A long stretch of unmaintained dirt road that is corrugated by closely-spaced ripples. The rippling occurs on some old unpaved roads over time as a result of dry weather conditions and continuous friction created by wheels moving quickly over loose sand and gravel. Washboard roads can be uncomfortable, and even dangerous to travel over, due to repeated bouncing created by the uneven surface, which can damage vehicles. 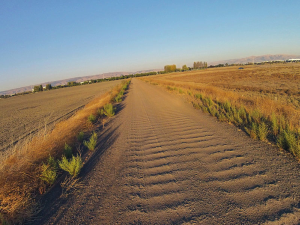 "A dirt road showing heavy amount of washboarding damage, Fremont, CA, September 30, 2012" by Benefactor123 is licensed under CC BY. 2002 Causes and cures for washboarding. StreetWise 2(1). http://www.t2.unr.edu/StreetWise/streetwiseSum02-V11-01.pdf, accessed May 11, 2015.